The payment to Kislyak's foundation was not made directly by McCaskill—it was made through a foundation, the Shepard Family Foundation, that she set up with her husband Joseph Shepard in 2013 but failed to disclose in filings to the Senate ethics committee until three weeks ago. 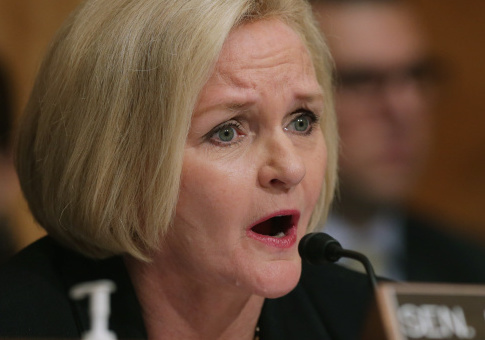 The sudden disclosure of McCaskill's role in the foundation—which had to be inserted into disclosures covering 2014, 2015, and 2016 through amendments on June 6—came as part of an attempt to distance herself from investments in an opioid manufacturer. It was during the process of correcting the investments that McCaskill discovered she had failed to disclose her position on the foundation's board of directors in Senate filings, her office said. A McCaskill spokesman said the senator's decision to use the then-undisclosed foundation to pay for the dinner was not part of an attempt to hide it. "Senator McCaskill and her family support a variety of causes through the Shepard Family Foundation, including this donation at a nonprofit event honoring a beloved Missouri Congressman," said John LaBombard. The payment to Kislyak's foundation was properly disclosed in the foundation's 2015 tax filing, which also lists a $10,000 contribution to Planned Parenthood. "One of my daughters believes very strongly in the charitable side of care given by Planned Parenthood," she said. "I could have said no, but that's not the way we do this." Events held by the American-Russian Cultural Cooperation Foundation have been attended by high-profile Republicans and Democrats alike, but McCaskill's criticism of Attorney General Jeff Sessions for meeting with Kislyak has put the spotlight on her. McCaskill has quoted a Democratic colleague on the Senate Armed Services Committee who said he "would never dream of meeting with the Russian ambassador without the State Department there because we know they spy on us." McCaskill has given a detailed list of the foundation's contributions to local reporters because of increased interest in the foundation since her involvement was disclosed to the Senate. This entry was posted in Issues and tagged Claire McCaskill, Russia, Senate, Senate Democrats. Bookmark the permalink.